WALPOLE, N.H. – The Granite State Pro Stock Series has just three races remaining on the 2017 championship schedule and the battle for the title is heating up heading for Star Speedway this coming Friday and Saturday night. The GSPSS will be part of the annual Star Classic weekend, which is a two-day show that also includes the International Supermodified Association (ISMA). The GSPSS will compete in a 100-lap feature event on the slightly banked asphalt oval in Epping, N.H.
PLACE: Star Speedway, Epping, N.H. Entries for the race include plenty of series regulars who are hoping to crack Victory Lane before the season ends. Defending champion Barry Gray has not won a race in over one year, but we will look to return his No. 29 to glory Saturday. Names like Scott MacMichael, Cory Casagrande, Nick Lascuola, Devin O’Connell and Monadnock winner Josh King are also entered in the field for the 100-lap race. Mike O’Sullivan will be looking to pad his points lead with his first checkered flag of the year. Outsiders looking to take down the win include former series champion Derek Griffith, Jacob Dore and Todd Stone. At White Mountain Motorsports Park, Stone rolled his No. 1vt into Victory Lane this year. With the Star Classic being a two-day show, GSPSS teams will practice and qualify on Friday. Practice rolls from 5:25-5:45 p.m. and 6:35-6:50 p.m, while qualifying heats, which will be 12 laps, begin at 7:45 p.m. on Friday. Saturday, the series will practice from 1:15-1:30 p.m. and 2:40-2:55 p.m., as well as a consolation event before the Star 100 takes the green flag, which is scheduled for just after 6 p.m.
Last time the series was on the track, Garrett Hall rolled into the winner’s circle at Oxford Plains Speedway as part of Oxford 250 weekend. Leaving Star, only two races will remain on the schedule. The Sunoco World Series at Thompson and the season finale at New London-Waterford will be left to go. 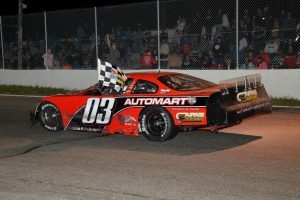 For more information on the Granite State Pro Stock Series, fans are encouraged to visit www.gspss.net and follow the series on Facebook and Twitter for updates.